You may remember a few months ago when Melanie’s exquisite red Nutcracker Garden Party dress was featured here on the blog. 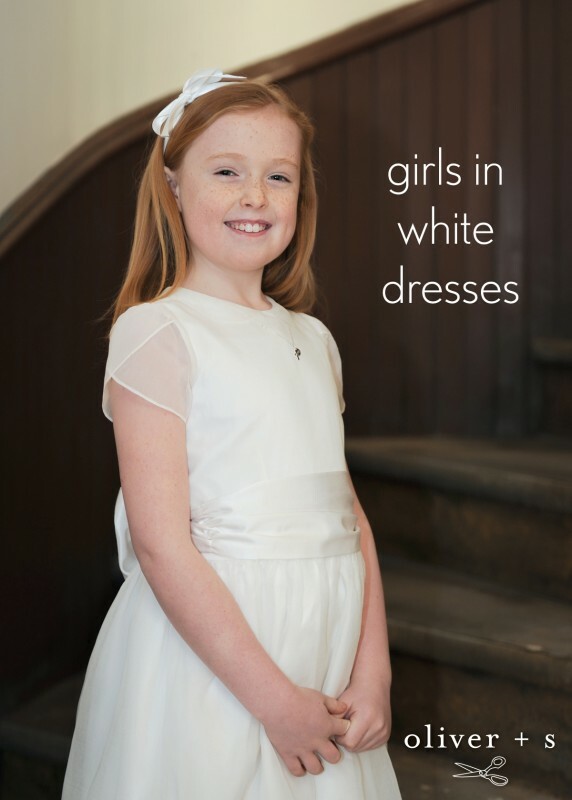 Melanie, who blogs at Queen of the Flies, is visiting today to talk about working in white to create dresses for special occasions like a Christening, Baptism, First Communion, or for a flower girl in a wedding. There’s no reason to be afraid of white clothes for children. White washes up beautifully, and while it needs some extra construction steps, nothing is quite so charming and sweet as little girls in white dresses. 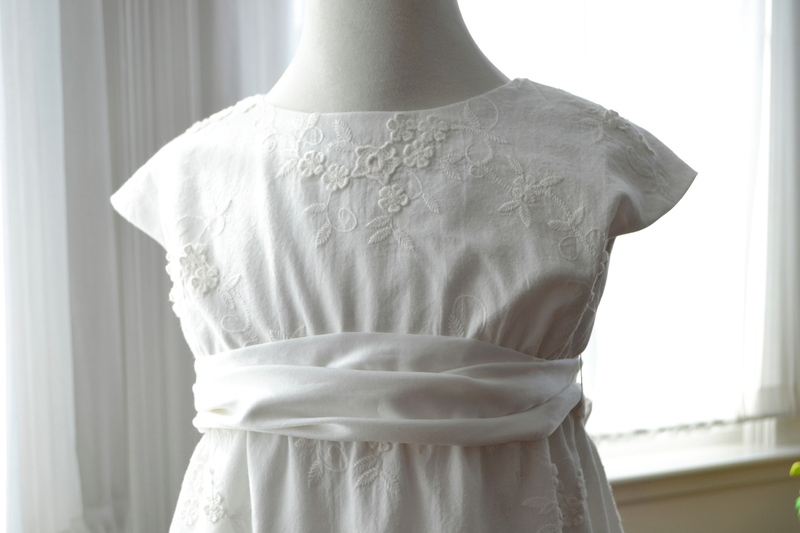 My very favorite thing to sew is a little white dress. 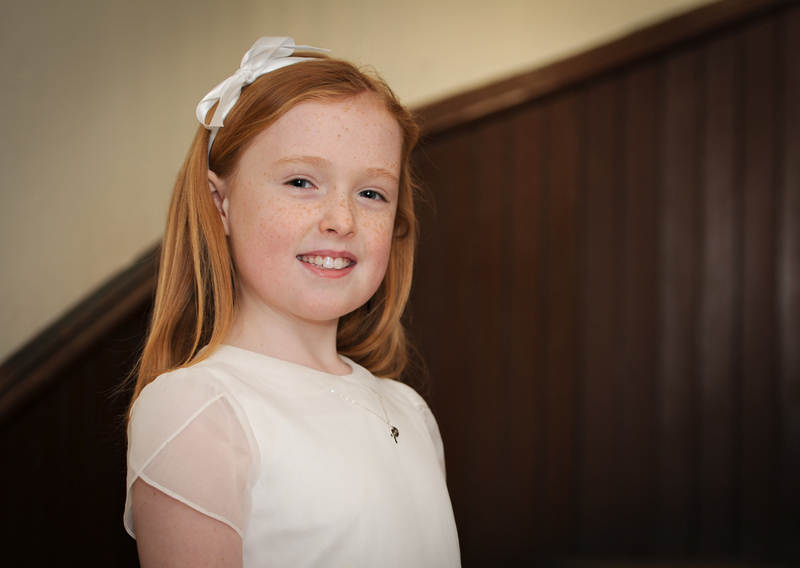 It’s the little girl counterpart to a woman’s little black dress: classic and suitable for so many childhood occasions. White is still the color of choice for important occasions like baptism, portraits, First Communion, graduation or your wedding day, but it can be carefree and casual too. 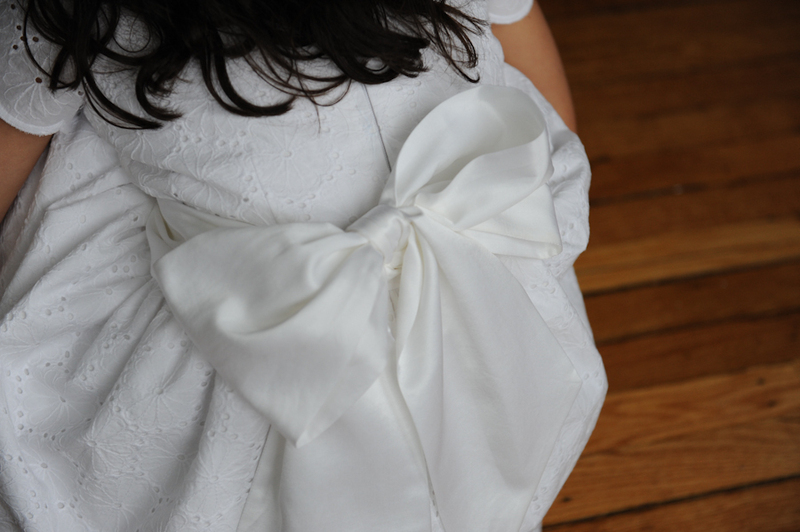 I think maybe we all have a soft spot for girls in white dresses – blue satin sashes or not. I relish the design challenge of working with just one color. To add interest to a white dress, I do what designers do in a white room: play with texture. There are endless possibilities with lace, tucks, pleats, embroidery, contrast, etc. The sheer quality of some white fabrics can itself be a textural element. 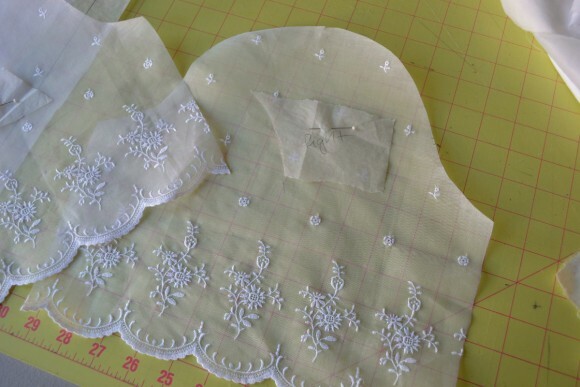 Lace can be applied on top of your garment, or you can piece many laces together to create a “fancy band” to sew into a bodice or skirt hem. Tucks can be teeny or very large and anywhere in between. They are simple and charming on their own or more intricate embellished with decorative stitches. Hand embroidery is another lovely way to make a dress special. You can also buy fabric with beautiful embroidery done for you! Some patterns have interest built in. The overlapping neckline of the Library Dress could nicely play up a striped fabric. Wouldn’t the ruched bodice of the Garden Party Dress be ever so romantic in a delicate white voile? You might even use the sweet tulip sleeves of the Fairy Tale Dress to create texture as I did here with sheer organdy sleeves. The Fairy Tale is my go to pattern for special occasions. It is a classic shape and a blank canvas for your imagination. 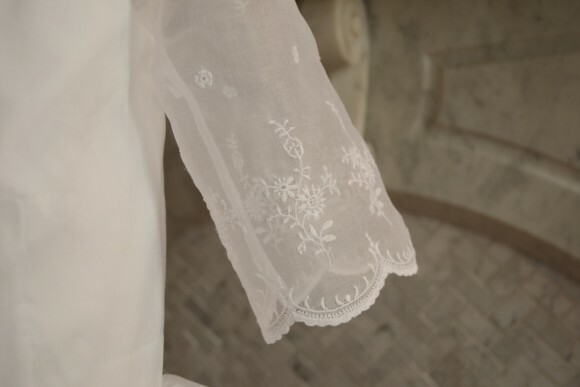 Here is a simple one in white broderie anglaise. You can see I redrafted the sleeve and used a full separate sash with loops. This way, you can change out the sash for a completely different look. Here is another Fairy Tale dress in fine cotton organdy with an embroidered edge. Silk satin roses adapted from the Dior rose tutorial accent the waist. 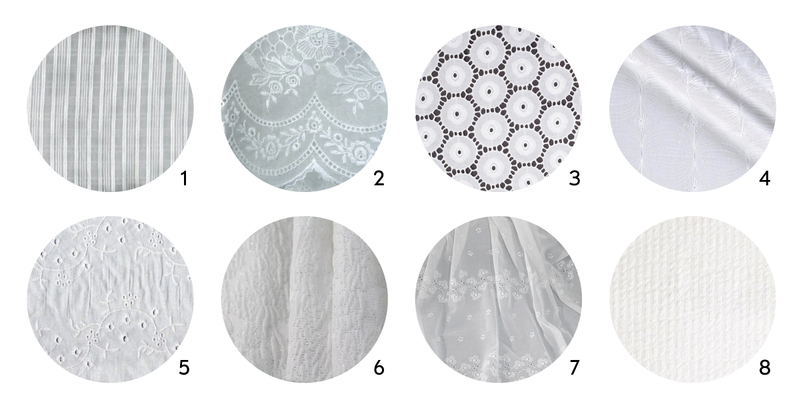 Working with white fabrics requires special consideration, but it’s not as hard as you may think. Before starting a white project, I clean my ironing board cover, my iron and my sewing machine. I put in a fresh needle and a new rotary cutting blade. I use silk pins that are kept aside for special projects. They don’t snag or leave marks. It can be difficult to tell the right from the wrong side, so I pin a piece of tissue paper to the right sides. Even heavy white fabrics are at least a little bit see through. This requires extra care in marking and finishing seams. I’m partial to the wax paper method of transferring pattern pieces, but those permanent marks are a complete no-no with white! While there are lots of markers or pencils that may work, you must test them carefully every time to see how they work on the fabric at hand. I don’t like to waste time testing myself, so I use tiny snips or tailor’s tacks to mark my white fabric. I have also found that my tracing wheel sometimes leaves an imprint without the wax paper. Since whites are mostly pretty sheer, seam and dart allowances will show. Depending on your goal, there are a few ways to handle this. Underlining with a more opaque fabric will reduce your seam show through and provide coverage. My formal white dresses are underlined with cotton poplin. It’s just tightly enough woven that it provides good coverage and support. However, for less structure and more drape, the silk/cotton Radiance satins are pretty opaque as well. That would make a good lining for a voile Garden Party dress, for instance, where you want drape and movement. You can of course decide that show through is acceptable – or even desirable. I often leave sleeves sheer. A casual linen dress for a beach portrait would also be charming with the sunlight showing through. Neat seam finishes are important with white fabrics. French seams are my very favorite way to finish many things, especially fine white dresses. Typically, all layers of my skirts are finished separately with French seams. I also use French seams in sheer sleeves and at the armscye. It’s neatly and much more comfortable to wear. Due to the bias nature of armscyes, French seams are not as awkward as you think, I promise! To hem a sheer fabric, cut precisely and hem by hand. I love the look of a 4” double turned hem, such as in the Fairy Tale dress. Take extra care hemming by hand to make sure your stitches really are invisible. Have you seen this genius tip for even spacing? Even regular sewing thread will show on sheer fabrics! Coats and Clark make a fine white sewing thread that is helpful for lightweight fabrics. I’ve seen this at my local Jo-Ann. Thank you so much Melanie for sharing your experience and expertise, your white dresses are gorgeous! This is an amazing post! Thank you for sharing these gorgeous sewing and all these really useful tips. I completely love all-white, it’s just so flattering on every child. My mother-in-law still has her stunning embroidered cotton organdy wedding dress from 1958. I fantasize about that dress and all the things I could make if I could lay hands on some cheap organdy. Alas! No such thing. Thanks for sharing! Would love a tutorial on how to redraft a sleeve for the fairy tale dress. I tried and failed. You’re very welcome, Sarvi! Yes, organdy is spendy these days. However, there are lots of lovely options in white. Voile, batiste, linen or satin are nice choices for special occasions. Seersucker, eyelet, linen and other kinds of embroidery are a fine choice for other occasions. The Roller Skate Dress above is made with fabric from Joann! This post has so much quality information. Thank you so much! Love the links you provided for Tailor’s Tacks & “genius tip” . 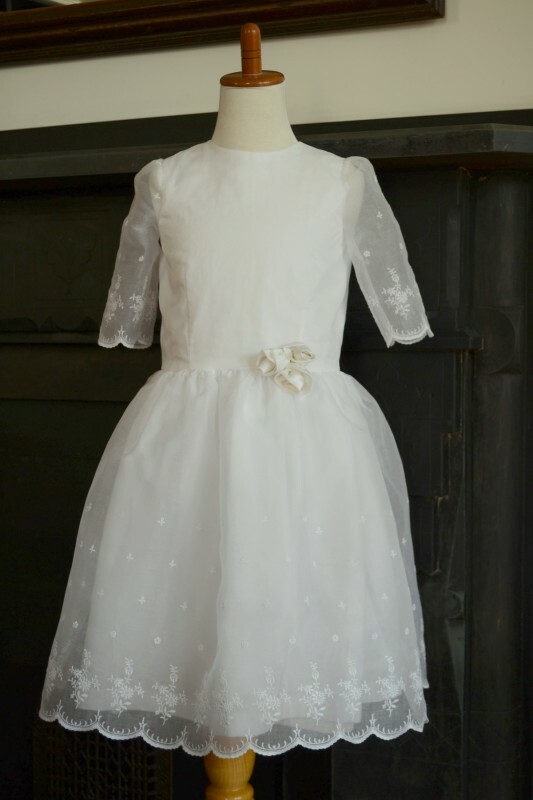 White is timeless for babies & little girls garments. So pure & clean. Melanie you make white on white look soooo good! I imagine these dresses look just as beautiful wrong side out. Thanks for the tips. Such helpful hints and beautiful dresses! That thumb mark for spacing hand sewing is probably going to change my life. Seriously. So exquisite and beautiful!!! Love them all!! Such stunning dresses and beautifully photographed. I appreciate the tips like cleaning the iron as that’s exactly the kind of stuff up I’d be guilty of! lol, Shelley! I skip lots of things I shouldn’t when it’s just play clothes. But for something like this, the last thing you want is the iron spitting up all over your lovely work. Ann, that tip changed my life too. I’m happy to pass it on. Nancy, that would be a good post to do. A couple of sleeve options opens this dress to a world of possibilities! Thank you everyone else for the compliments. Will you be trying anything white? Would the croquet or popover dress be super adorable in white eyelet for the beach? Get the kind with a finished selvedge and you won’t have to hem! these dresses are just so, so beautiful!! you’re an artist. i especially love the sheer overlays. will need to keep these in mind when my daughter has her first communion next year!